Sunday with Stephanie — always with butter. So the farmer's market. It had the most glorious eggs ever. I fell in love with them. 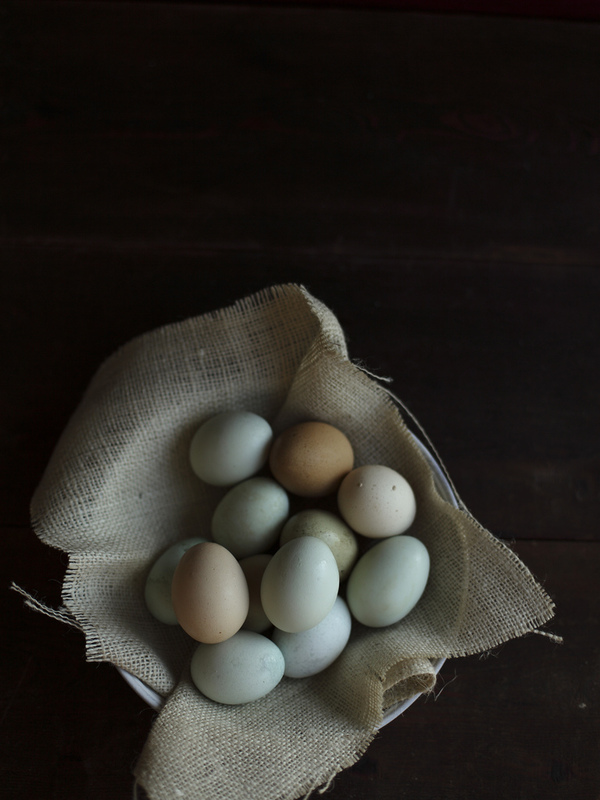 There were four big bins of them, 2 of chicken eggs in the most beautiful pastel colors. Then 2 of duck eggs, pale pink, off-white, and a few dark grey almost black colored. Swooning over them, I immediately grabbed a carton and began searching for the best ones. They all had to be just a bit different, sizes, shapes, colors. I took a massive amount of photos of them, this post as proof. I have yet to even crack one, I don't want to. I should because they probably taste fabulous, but it's my first time getting eggs like these. I'm putting it off. The backgrounds were the main objective of the visit. We started off at Home Depot, finding the 'right' wood that would give the old look we wanted but would still be able for us to transform. Sanding, painting many coats, try to get that crackle finish (which is a lot harder than that silly little bottle says) and leaving a few boards for my next trip down there. I left with two new backgrounds that I already adore, many thanks to Stephanie for a great day. Oh and we made muffins! Lemon Verbena with Olallieberries. Two things I had never had before. Early in the day she said to me something like, Do you know any good recipes for Lemon Verbena? I have so much now! My first reaction being 'Umm thats some kind of herb-y thing right?' Knowing only that I have vaguely heard about it online, but never had tasted it or seen it in markets. So I wasn't much help in that department. But when we decided that we must bake something, well come on were food bloggers, how could we not? So when we somehow came upon muffins, because they were much quicker than the yeasted bready things that we first talked about. So the lemon verbena was a must, muffins were the vechine of choice and then she remembered the olallieberries that she had in her freezer. Of course I didn't know what they were either. So they are kinda like blackberries but sweeter? tarter? I honestly can't remember now, but I know they were awesome. Not many of those muffins made it home on that hour and a half drive.